Thank you for your interest in becoming a staff member at Farm Camp. Our online application is available here between December and May each hiring season. The 2019 application will open on December 1st, and we will begin scheduling interviews after January 1st, 2019. Click “Apply Now” from the menu on the right. We hire about 30% of the staff through international placement agencies, bringing in qualified instructors and counselors from Europe, New Zealand, and Australia. International staff bring a wonderful diversity of culture and experience to camp. Farm Camp was founded In 1952 by Abe and Eve Crittenden. They created a philosophy to share the enchanted place that is Plantation and transformed it into a summer farm camp for children. This vision, which continues today, was to create a community where people could live in peace with each other and nature while having fun and building strong relationships. The property is located 2.5 hours north of San Francisco in Sonoma County, CA nestled in the infamous redwood forest just a mile and a half from the Pacific Ocean. To nurture the goodness of the human spirit by sustaining and growing this unique farm camp community. We welcome an average of 100 campers each session, about 40/60 boys and girls. Campers range in age from 8-14 years old most sessions. We offer a concurrent Counselor-in-Leadership-Training (CILT) program for campers entering the 10th-12th grade in the fall. The majority of our campers come from communities around the Bay Area and Los Angeles, however, we do get a number of campers from around the United States as well as other countries. We are also lucky to have the ability to host a small percentage of our campers through non-profit organizations in San Francisco. Our program is designed to balance independence, choice, challenge, and support. We strive to provide an environment where kids grow by feeling comfortable enough to step outside their comfort zones, and try to new things. Our staff are the most important component in creating an amazing camp experience for our campers. Counselors are assigned to a unit, but also lead activities during the day. Counselors spend about a third of the day with their unit ( Morning, Siresta, Evening Program, Specialty days, and Bedtime), and the other two-thirds of the day is spent leading activities. Skills such as horseback riding, guitar/ music, ropes course, wilderness survival, arts & crafts, farm animal care, Horticulture, photography, lifeguarding, and performing arts are particularly desirable. Applicants are expected to be able to work from the beginning of staff training until the end of camp. If your available dates fall outside of this range, or you have other scheduling conflicts, please email the office before applying. 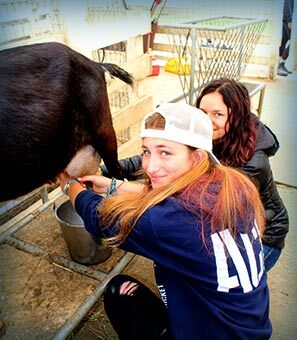 Farm Camp provides a week-long Staff Training before the summer sessions begin. This week is spent orienting counselors to all aspects of camp and the job, including working with campers, leading activities, traditions, skits and songs, rules and regulations, and emergency procedures. We are committed to helping counselors excel at their jobs. Ongoing support for counselors is provided throughout the summer in many forms. Head Counselors and Directors are available at all hours for mentoring, advice, and support. Counselors receive 2 informal “Check-In’s” during the summer for reflection and feedback on their job performance.